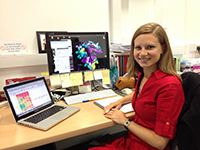 Iuni Trist is in the latter stages of her PhD in medicinal chemistry at Cardiff University. Iuni’s route to a PhD began in Italy and her reflections may help those reading this who may be considering coming to the UK to undertake their research. My undergraduate degree was Masters-equivalent Italian degree in Chemistry and Pharmaceutical Technology, from Padova University, in Italy. This is a five year degree and I continued on to a PhD immediately after I had completed my first degree. This is a Medicinal Chemistry PhD that involves both molecular modelling and synthetic chemistry with the aim of designing novel drugs against dengue virus infection. Dengue virus is becoming a serious worldwide concern and as it can be lethal, it is important to discover novel therapeutic agents. However, even if the research topic is very interesting, I was more interested in the methodologies involved: molecular modelling and synthetic chemistry. I have always been a very curious person that loved to learn new things. So, when at High School in Italy I was doing lab work I discovered that research was the road I wanted to pursue. During University I understood that in order to do this I had to get a PhD and I went for it. As I was already working with my supervisor, I had more of a chat about the project rather than an interview. Definitely the main difference has been being in the lab and doing more independent work, rather than simply studying textbooks and following procedures designed by other people. The main challenge which has also helped me to “grow” as a scientist has been to work independently and to find new ideas to tackle problems. Then, a second major challenge is now, at the end of my third year: finish everything in time and write up all the data. During my PhD I have followed many workshops (e.g. for presentation skills, team work, time and project management, etc. ), I have done some demonstrations, I have contributed in building a blog on virology with other virologists, I have spent one month in Marseille University learning biochemical assays and I have helped my supervisor to organise a one week training. I really enjoyed the research and to work with really motivated people in the lab, even if we were all working on different topics. Then, I enjoyed all the extra experiences described above as these gave me a more complete experience. During my PhD I have learned to manage a research project both independently and in a team. Furthermore, I was able to establish and maintain interesting and useful collaborations with other institutions. I have also improved my presentation and teaching skills as well as specific technical ones related to molecular modelling and synthetic chemistry. I think I have also learned to deal with pitfalls as scientific experiments do not always go as planned. When I started I was sure I wanted a career in Academia. Now, that I have seen how Academics spend their time (e.g. looking for money all the time) I am also considering the possibility of a job in an industry. I would suggest to make the most out of it and to exploit every chance to get a complete experience. Do not focus only on the research subject and learn to be flexible.